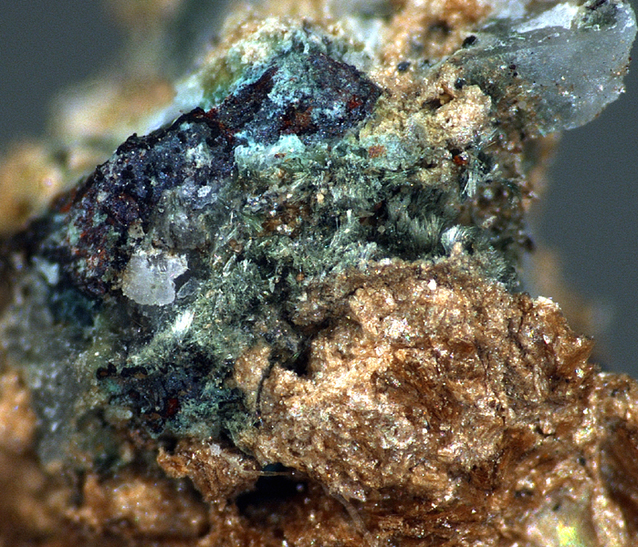 Poppiite: Mineral information, data and localities. In memory of Luciano Poppi, Professor of Mineralogy, Modena and Reggio Emilia University, and all his generous and fruitful efforts devoted to mineral science. 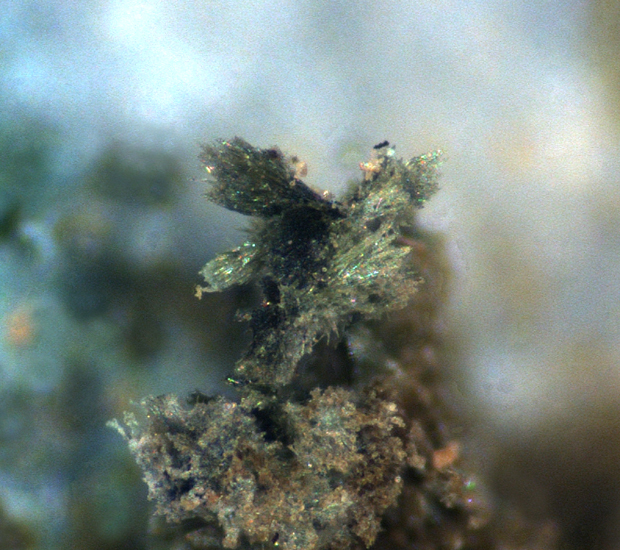 Minute (0.1 to 0.6 mm) prismatic crystals. Museo Mineralogico e Geologico Estene, GEMMA 1786 at the Modena and Reggio Emilia University, Italy. Julgoldite-(Fe2+) Ca2Fe2+Fe3+2(Si2O7)(SiO4)(OH)2 · H2O Mon. Julgoldite-(Fe3+) Ca2Fe3+Fe3+2(Si2O7)(SiO4)O(OH) · H2O Mon. Julgoldite-(Mg) Ca2MgFe3+2(Si2O7)(SiO4)(OH)2 · H2O Mon. Okhotskite Ca2(Mn,Mg)(Mn3+,Al,Fe3+)2(Si2O7)(SiO4)(OH)2 · H2O Mon. Pumpellyite-(Al) Ca2Al3(Si2O7)(SiO4)(OH,O)2 · H2O Mon. Pumpellyite-(Fe2+) Ca2Fe2+Al2(Si2O7)(SiO4)(OH)2 · H2O Mon. Pumpellyite-(Fe3+) Ca2(Fe3+,Mg)(Al,Fe3+)2(Si2O7)(SiO4)(OH,O)2 · H2O Mon. Pumpellyite-(Mg) Ca2MgAl2(Si2O7)(SiO4)(OH)2 · H2O Mon. Pumpellyite-(Mn2+) Ca2Mn2+Al2(Si2O7)(SiO4)(OH)2 · H2O Mon. Shuiskite Ca2MgCr2(Si2O7)(SiO4)(OH)2 · 2H2O Mon. Goldmanite 2 photos of Poppiite associated with Goldmanite on mindat.org. Vanadomalayaite 1 photo of Poppiite associated with Vanadomalayaite on mindat.org. 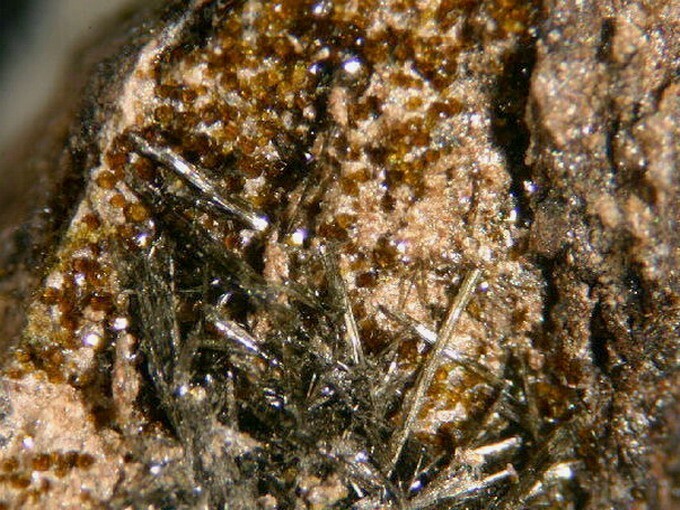 Ganophyllite 1 photo of Poppiite associated with Ganophyllite on mindat.org. 9.BG.20 Julgoldite-(Fe2+) Ca2Fe2+Fe3+2(Si2O7)(SiO4)(OH)2 · H2O Mon. 9.BG.20 Okhotskite Ca2(Mn,Mg)(Mn3+,Al,Fe3+)2(Si2O7)(SiO4)(OH)2 · H2O Mon. 9.BG.20 Pumpellyite-(Fe2+) Ca2Fe2+Al2(Si2O7)(SiO4)(OH)2 · H2O Mon. 9.BG.20 Pumpellyite-(Fe3+) Ca2(Fe3+,Mg)(Al,Fe3+)2(Si2O7)(SiO4)(OH,O)2 · H2O Mon. 9.BG.20 Pumpellyite-(Mg) Ca2MgAl2(Si2O7)(SiO4)(OH)2 · H2O Mon. 9.BG.20 Pumpellyite-(Mn2+) Ca2Mn2+Al2(Si2O7)(SiO4)(OH)2 · H2O Mon. 9.BG.20 Shuiskite Ca2MgCr2(Si2O7)(SiO4)(OH)2 · 2H2O Mon. 9.BG.20 Julgoldite-(Fe3+) Ca2Fe3+Fe3+2(Si2O7)(SiO4)O(OH) · H2O Mon. 9.BG.20 Pumpellyite-(Al) Ca2Al3(Si2O7)(SiO4)(OH,O)2 · H2O Mon. 9.BG.20 Julgoldite-(Mg) Ca2MgFe3+2(Si2O7)(SiO4)(OH)2 · H2O Mon. Caprilli, E. (2004): Miche e cloriti: implicazioni cristallochimiche. PhD thesis, University of Modena and Reggio Emilia, 205 pp. Caprilli, E. (2005): Micas and chlorites: crystal chemical implications. Plinius 31, 65-70. Brigatti, M.F., Caprilli, E., Marchesini, M. (2006): Poppiite, the V3+ end member of the pumpellyite group: Description and crystal structure. American Mineralogist 91, 584-588. Nagashima, M., Matsumoto, T., Yamada, T., Takizawa, M., and Momma, K. (2018): Crystal chemistry of poppiite, V-analogue of pumpellyite, from the Komatsu mine, Saitama Prefecture, Japan. Journal of Mineralogical and Petrological Sciences, 113, 251-262. Brigatti, M.F., Caprilli, E., Marchesini, M. (2006): "Poppiite, the V3+ end member of the pumpellyite group: Description and crystal structure", American Mineralogist 91, 584-588. Nagashima, M., Matsumoto, T., Yamada, T., Takizawa, M., and Momma, K.(2018) Crystal chemistry of poppiite, V-analogue of pumpellyite, from the Komatsu mine, Saitama Prefecture, Japan. Journal of Mineralogical and Petrological Sciences, 113, 251-262.